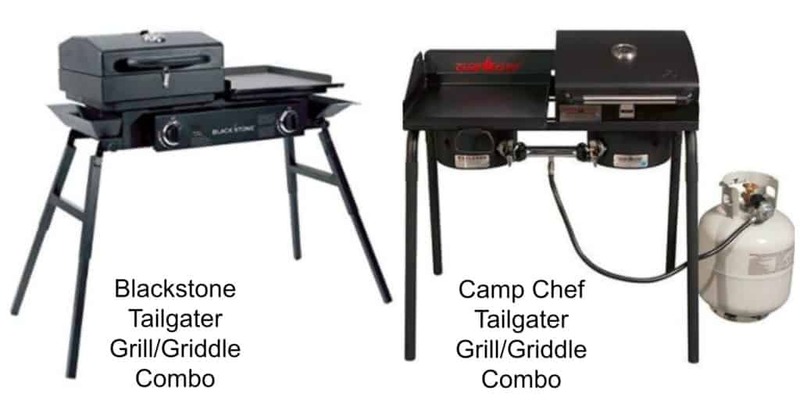 Both Blackstone and Camp Chef offer a gas grill griddle combo and have named their products the Tailgater. While these products look similar on the surface there are some differences between them that are worth reviewing. One thing that these products have in common is that while the griddles are great the grill boxes are not that exciting. This downside is similar to what you see for smoker grill combos. That’s okay though because you can easily remove the grill box when you don’t need it and and have direct access to the burner. Direct burner access lets you put on a stock pot, dutch oven, etc. 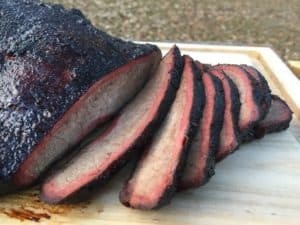 for expanded outdoor cooking options. Here is the promotional video from Blackstone. It does a nice job of showing the main features of this grill. One stainless steel burner (15,000 BTU/hr) for the griddle. One cast iron burner (20,000 BTU/hr) for the grill box. The Camp Chef Tailgater is essentially a package bundle that includes their Explorer 14 inch camp stove, BBQ Grill and Flat Top Griddle. Here is a video from someone who bought the components separately. The end product is identical to the Camp Chef Tailgater. Two cast aluminum burners (30,000 BTU/hr each). What is Different Between These Products? The Blackstone griddle (252 square inches) is slightly larger than Camp Chef’s (224 square inches). The griddle is the cooking surface that you will use the most. The Camp Chef griddle comes preseasoned and ready to use while the Blackstone griddle is unseasoned and comes with a protective coating of soy oil. It will take you a couple of hours to get the Blackstone griddle properly seasoned before use. How the griddles are heated is different as well. The Blackstone griddle is heated by a single stainless steel 15,000 btu/hr burner that splits into an H shaped two burner configuration like you get on Blackstone’s 17 and 28 inch griddles. The H shape helps the single burner deliver even heat across the griddle surface. The Camp Chef griddle is heated by a single cast aluminum 30,000 btu/hr circular burner. To promote even heating across the griddle Camp Chef has welded a large heat deflector onto the back of the griddle. You light the Blackstone with an electronic ignition system. You light the Camp Chef manually with a long lighter. While this might seem like an advantage of the Blackstone I am not sure that is true. Every electronic igniter on any grill that I have owned has died after one or two grilling seasons. At least the Camp Chef is already designed for easy manual lighting. Both products have adjustable legs that let you level the griddle when set up on uneven surfaces. The legs on the Blackstone are splayed out and offer a little more stability than the Camp Chef. The Camp Chef gets bonus points from me for the wind shield that attaches to the frame. If I was spending my own cash I would put my money on the Blackstone. The heart of these products is the griddle and I think Blackstone has done that part better. The Blackstone griddle is larger than Camp Chef’s. I believe that the H shaped burner on the Blackstone will deliver more even heating than the circular burner on the Camp Chef. The previous version of the Blackstone tailgater used the same circular burner design under the griddle that Camp Chef is currently using. Blackstone realized that the design was not particularly great and switched over to the H shaped burner. Also, I am always looking for the best value in a grill and can’t see any reason to justify the higher MSRP of the Camp Chef Tailgater.